After five long, cold days without power at the end of October, I’m very slowly returning to normal. By “normal” I mean that I’m starting to feel like I can once again plan and shop for several days worth of meals all at one time. Up until this past weekend, I could only bring myself to shop for food the day I needed it. I had this nagging fear that the power would suddenly go off and I would once again lose everything in my refrigerator. I guess I’ve been having a kind of mild post traumatic loss of electric-power stress reaction: I keep checking the clocks to make sure they have the right time. I stop at my refrigerator several times a day just to make sure it’s really working. I do laundry a lot – even tiny loads- so it won’t pile up. I turn off all plugged in computers whenever they’re not in use, so they won’t be damaged if there’s a power surge. I wash my hair more than normal, in case I won’t be able to if the power goes off. I keep my cell phone completely charged at all times. I bought enough candles to get me through the next millennium and I keep flashlights strategically placed around the house. Yes, I’ve been in a sorry state. On top of all this, I’ve been craving the kind of savory, autumn meals you see in food magazines, on food website and blogs, and on restaurant menus. I mean real meals – not throw-together meals. I mean the kind meals that require planning and shopping. Oh my. How long could I hold out? At long last, I decided the moment had come. It was time. Time to venture out and buy some meat that I won’t use the exact same day. I planned one of my favorite autumn suppers- Pork with Apples and Calvados. I bought some beautiful pork tenderloin on Friday with plans to use it on Sunday. Why Sunday? Because on Sunday I could go to the local farm market and buy some farm fresh apples and cider. Pork with Apples and Calvados is a wonderful way to usher in the harvest season. It combines fresh-picked apple flavor with savory herbs and tender pork (you can make it with chicken if you don’t like or can’t eat pork). It smells good while it’s cooking and it tastes delicious. And like so many of my favorite things, it’s easy to make gluten-free by using rice flour in place of wheat to dredge the pork. I like to serve it with creamy mashed potatoes, roasted Brussels sprouts, and a glass of red wine. But I think it would also be perfect with only a simple salad on the side – and the red wine, of course. 1. Trim the tenderloins and cut into 1 inch thick slices. Place each pork slice between sheets plastic wrap and pound to thickness of 1/4″ with a mallet or rolling pin. 2. Lay the pork slices on a plate and sprinkle with salt, pepper and 1/2 teaspoon thyme. Lightly dredge in brown rice flour. Set aside. (Can be prepared up to 3 hours ahead. Cover tightly with plastic wrap and refrigerate). 3. To prepare apples: peel, core and slice each apple into 16 slices. 4. Melt 1-tablespoon butter in heavy large skillet on medium-high heat. Add sugar and stir. Add apples and sauté until golden brown and tender, about six minutes. Set aside in microwavable dish. 5. In same skillet, melt 1 tablespoon butter over medium-high heat. Add half the pork slices and sauté about 2 minutes per side until browned and cooked through. Transfer to plate and cover loosely with foil. Repeat with another 1 tablespoon butter and remaining pork slices. Transfer cooked pork slices to foil covered plate. 6. Reduce heat to low and melt remaining 1 tablespoon butter in same skillet. Add thyme and shallots and sauté until shallots are soft, about 2 minutes. Turn heat to medium-high; add apple cider vinegar and boil until syrupy. Add the Calvados, scrape up browned bits and boil until syrupy. Add apple cider and heavy cream; boil until thickened to sauce-like consistency, about 2-3 minutes. Remove from heat. Season to taste with salt and pepper. 7. Put pork slices back into hot sauce and turn to coat slices. Reheat apple slices in microwave. 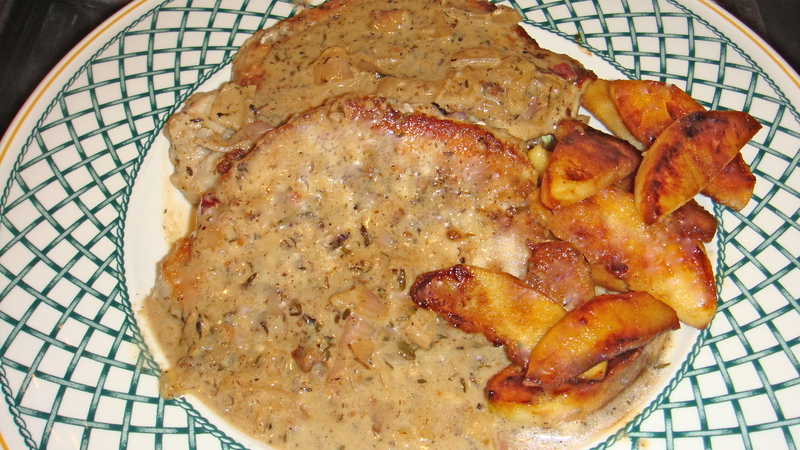 Serve pork topped with sauce and apple slices. I finally got around to making this dish for our Sunday evening family dinner. It would be an enormous under-statement to say that everyone loved it. But, EVERYONE LOVED IT!! It was perfect for a cold winter evening. The instructions—as always—were excellent, and the flavors were perfectly balanced. Thank you so much for all you do! So glad you enjoyed that dish. I really love it– and so does my family. They all come running when I make it. It really is the kind of meal that makes you look forward to dinner. Hope you have a happy, delicious holiday season!